what are you making today? I wish I could explain exactly what possessed me when I hit the “buy it now” button for this Ravelry pattern. Knitting toys is just not my thing…or so I thought. And then I discovered “Bunny girl in a dotty dress” by Julie Williams. Love at first sight. Was it her face? Her dress? Those cute little Mary Jane’s? Yes. Yes. Yes. I hit the button, paid with paypal, and printed the file. That was the easy part. 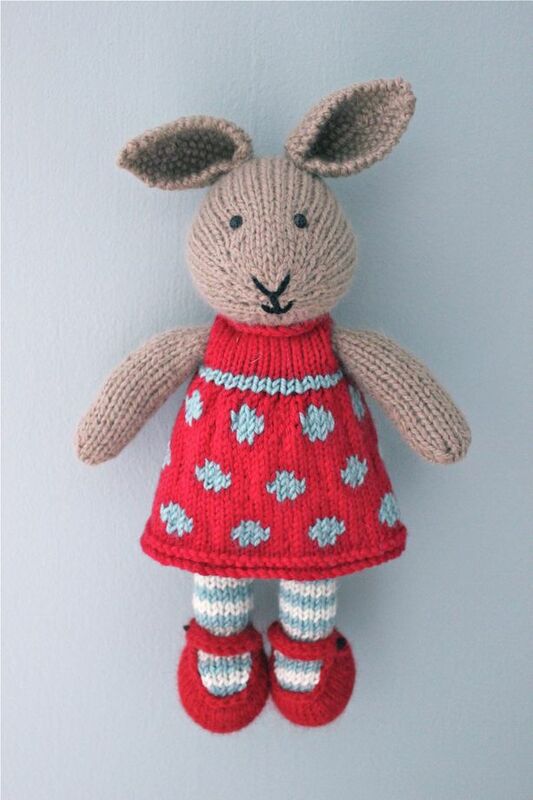 The word that best describes turning left-over balls of yarn into a sweet little bunny is, in the designer’s own words, “fiddly”. Had I looked up the true meaning of the word, I might have balked. “Complicated or detailed and awkward to do or use”. Fiddly. After all that fiddlin’ around, I was totally thrilled with my sweet bunny. She stands about 12″ tall from the tip of her ears to the tips of her toes, and I think she’s adorable! 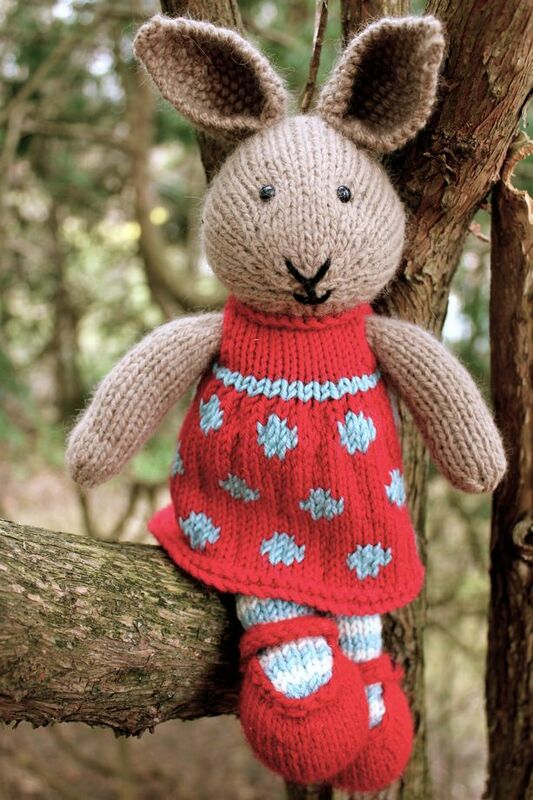 Julie’s website is Little Cotton Rabbits, and she offers free patterns, as well as patterns to buy. My next purchase will be “Boy bunny with a piebald patch”. He could be Bunny girl’s brother…significant other…or just a friendly playmate. In any case, he’s got my attention. 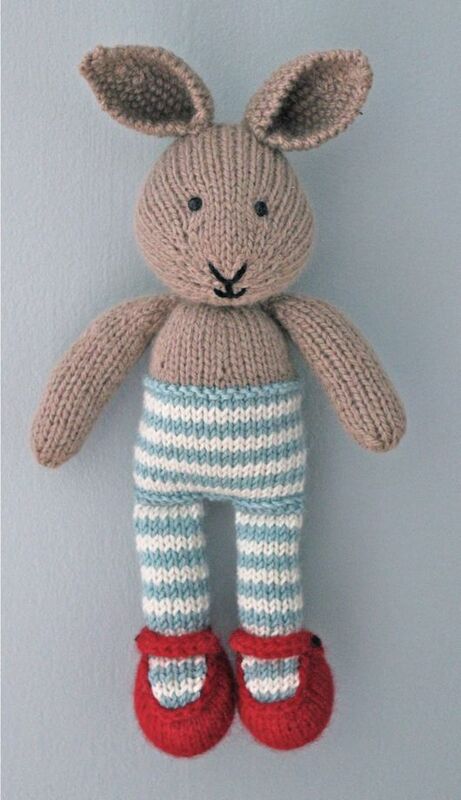 Don’t let a seemingly whimsical word like “fiddly” stop you from making a bunny of your own. I really did enjoy the process, and I plan on making several more…in the future…but not like next week. Your bunnies are absolutely adorable. I’m so glad that your aunt Linda connected me to you a few years ago. Thank you, Rosemarie. Hope all is well with you. Happy knitting!! Sooo cute…but you lost me at fiddly. I’ll just admire yours. Well done, my perseverant (is that a word? ), meticulous friend. I, too, got possessed to click that buy it now button. Still getting up my nerve to start. Found you through the Rav group. What a nice blog! Oh…you definitely have to get started! The directions are very easy to follow…I just took it one step at a time. I’ve made a few bunnies, two bears and I just completed a fox. So I guess I’m admitting to having a “buy it now” habit ;-) . Good luck, and I’ll look for your bunny on Ravelry!! Hi! We're Ann and Alyssa, a mother and a daughter who have shared a passion for making things since way back when this picture was taken. We have better tools now, and 'little a' grew a little taller, but we still love to gather around the kitchen table and make things for our family and friends to enjoy.